This Wednesday evening, film students and faculty from Hamline, St. Catherine, Macalester, St. Thomas, and Augsburg will gather at the first film festival of the Associated Colleges of the Twin Cities (ACTC). The event, titled "Show Us Your Stories," is the culmination of an effort on behalf of the colleges to collaborate on academic programs. The work of seven Augsburg students and alumni will be featured in the festival, which will be held Nov. 16 at 7 p.m. at the St. Anthony Main Theater in Minneapolis. Carole Chabries, ACTC executive director, said the film festival idea was generated when a group of faculty gathered to discuss opportunities for collaboration among the schools and to reenergize the focus on academic programming. "We want to find more ways to share resources and also to build on the strengths of each institution," she said. Jake Johnson '12 is a film production major whose music video Once an Ocean is a contender for best in show. Johnson said he feels the video represents his best work because it is one continuous shot in reverse and in slow motion. "I think it's a good piece of work technically, and it's also a catchy song," he said. 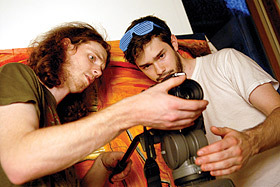 The Squatters, a piece by film major Cole Seidl '12 [above left], is also in contention for best in show. Seidl said the film is hard to describe, but he defined it as absurdist and experimental. "It's just me venting my frustrations with the administration of college and being sort of bitter about the education system." Seidl said. "It doesn't work in words, so I usually just show people." Chabries is pleased with the initial success of the festival, which received 50 entries. She expressed thanks to Augsburg film professor Wesley Ellenwood who she said "worked his tail off." She added that all of the faculty on the committee brought something unique to the process that was based on the strengths of his or her institution, which bodes well for future collaborations. After the festival, Chabries said the ACTC film faculty will reconvene to discuss lessons learned from the project. "We will also revisit the original question," she said, "which is, now that our students have come together in this way, what can we do with curriculum and courses, and how can we use the consortium to create what students want from their programs?" The film festival judges are: Christopher Grap, director of production services for the Minnesota Film & Television Board; Dawn Mikkelson, 2011 Pachamama Award Winner in the Possible Future Films contest, 2010 McKnight Fellow for Filmmaking, and founder of Emergence Pictures; Aleshia Mueller, owner of Reel Nomad Productions and president of Minnesota Women in Film and Television; and Lucinda Winter, executive director of the Minnesota Film & Television Board.